A-HOTEL.com - Luxury and cheap accommodation in Isayevo, Russia. Prices and hotel, apartment booking in Isayevo and surrounding. Гостевой дом features ski-to-door access, as well as accommodation with a kitchen in Podberezh'ye. All units come with a seating area, a flat-screen TV and a private bathroom with free toiletries and shower. Фермерская усадьба offers accommodation with a bar and free WiFi, and is situated in Domozhirovo. There is an on-site restaurant, which serves a variety of Russian dishes. Holiday Home Karelka offers accommodation with ski-to-door access and free WiFi, and is set in Domozhirovo. All units come with a fully equipped kitchen including a dishwasher and a living room with a flat-screen TV with satellite channels. Set in Chunovo, Guest House on Silovaya offers free WiFi. All rooms boast a kitchen and a shared bathroom. Recreation center Zaostrov'ye provides rooms in Zaostrov'ye. Among the facilities of this property are a restaurant, a 24-hour front desk and room service, along with free WiFi. In Storozhno-City Apartment offers accommodation in Storozhno. The accommodation features a flat-screen TV. Providing free WiFi, Syas Inn is set in Syasstroy. Boasting a 24-hour front desk, this property also provides guests with a restaurant. Situated in Zaozër'ye, Country house Pyatnistiy olen offers accommodation with access to a garden. Complimentary WiFi is provided. Set in Lodeynoye Pole, Guest House Provintsiya provides free WiFi. Guests can enjoy city views. Offering free Wi-Fi and safety deposit boxes, Svir Mini-Hotel is located in the centre of Lodeynoe Pole. This room features a tea/coffee maker. Petrovsky Hotel is offering accommodation in Lodeynoye Pole. The property offers a 24-hour front desk. Featuring free WiFi and a sauna, Guest House Andreevshchina offers accommodation in Andreyevshchina, 13 km from Novaya Ladoga and 20 km from Staraya Ladoga. Free private parking is available on site. Featuring barbecue facilities, a garden, and a terrace, Usadba offers accommodation in Kulakovo with free WiFi and pool views. Boasting a balcony, the holiday home is in an area where guests can engage in activities such as skiing, snorkelling and table tennis. Located in Nemyatovo-2 Village on the bank of a canal, Ladoga Villas offer self-catering accommodation with free private parking. Guests can enjoy hiking and fishing in the surroundings. 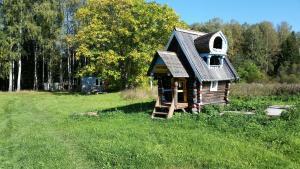 Facing the lakefront in Novaya Ladoga, Baza otdikha Krenitsy has a garden and a terrace. The property features a bar, as well as a restaurant serving Russian cuisine. Located in Novaya Ladoga in the Leningrad region, Однокомнатная квартира в центре has a balcony. The property features lake views. With ski-to-door access and barbecue facilities, Baza Otdykha Gorizont provides accommodation with free WiFi. Guests wishing to travel lightly can make use of towels and linens for an additional supplement. Located at the banks of the Volkhov River in Issad, Abyrvalg Hotel features a sauna, fitness centre and terrace. Free parking is available on site.